This is one sweet little Bahama Island. Paradise Island is home to the Atlantis Resort, the sprawling resort that has become one of the favorite vacation destinations in the Caribbean. 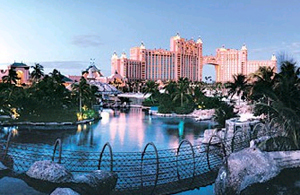 Atlantis Paradise Island Bahamas features four separate hotels, a massive convention center, timeshares, pools, beach access, restaurants, walk-in aquarium and a casino, situated amidst one of the largest vacation playgrounds in the world. Formerly known as Hog Island, the island is a little over two square mile (2.8 kmsq) or about 685 acres. Paradise Island is connected to the island of New Providence by two bridges that cross Nassau Harbour. Nassau, the capital city of The Islands Of The Bahamas, is located on the northeast shore of the island of New Providence. Tiny Paradise Island is directly across the bridge, located just off the shore New Providence. One of the most beautiful sites on Paradise Island is The Cloisters, the remains of a 14th-century French monastery which was transported to the island in the 1920s by William Randolph Hearst, and finally erected in the 1960s by Huntington Hartford. The Paradise Island Lighthouse, constructed in 1817, is located at the western tip of the island and is one of the first things cruise ship visitors see when entering the harbour. Pristine beaches, duty-free shopping, dazzling casinos, exciting attractions, historical landmarks, posh resorts, plus water and land sports of every kind are all waiting for you. And they're all just a "stone's throw" away from each other. More Bahamas vacation information can be located on the Bahamas Travel.info Home Page. Copyright © 2002-2016, Bahamas-Travel.info All Rights Reserved.